Many times it could be very convenient to have a compressed filesystem, so a system that compresses data in Real Time. This not only reduces the space used, but increases the IO performance. Or better explained, if you have to write to disk 1GB log file, and it takes 5 seconds, you have a 200MB/s performance. But if you have to write 1GB file, and it takes 0.5 seconds you have 2000MB/s or 2GB/s. However the trick in here is that you really only wrote 100MB, cause the Data was compressed before being written to the disk. This also works for reading. 100MB are Read, from Disk, and then uncompressed in the memory (using chunks, not everything is loaded at once), assuming same speed for Reading and Writing (that’s usual for sequential access on SAS drives) we have been reading from disk for 0.5 seconds instead of 5. Let’s imagine we have 0.2 seconds of CPU time, used for decompressing. That’s it: 0.7 seconds versus 5 seconds. So assuming you have installed ZFS in your Desktop computer those instructions will allow you to create a ZFS filesystem, compressed, and mount it. 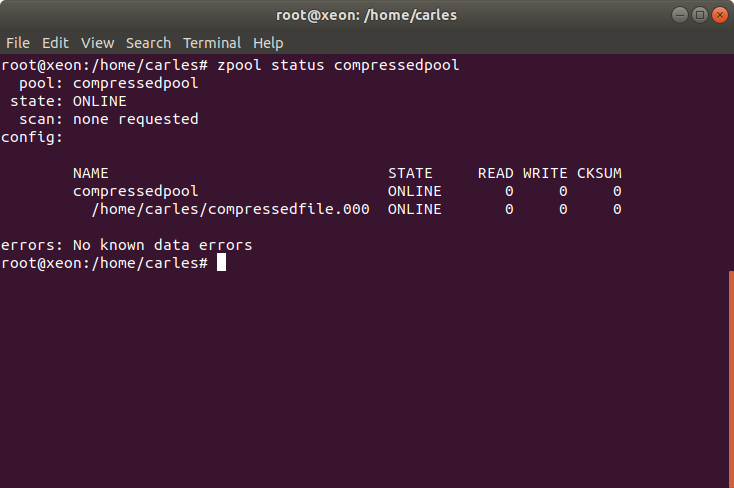 ZFS can create pools using disks, partitions or other block devices, like regular files or loop devices. Even if the pool only had 1GB we managed to copy 1.33 GB file. Then we check and only 142MB are being used for real, thanks to the compression. You can also create a pool using several files from different hard drives. That way you can create mirror, RAIDZ1, RAIDZ2 or RAIDZ3 and not losing any data in that pool based on drives in case you loss a physical drive. If you use one file in several hard drived, you are aggregating the bandwidth. This entry was posted in Performance, Storage and tagged Compression, LZ4, ZFS on 2018-09-26 by Carles Mateo.